Bee venom is a complex mixture of enzymes, polypeptides, amino acids, and sugars. Traditional Chinese medicine uses bee venom acupuncture to treat arthritis and pain. However, the components of bee venom are the subject of biomedical research for their potential painkiller, antithrombotic, and antibiotic properties. The polypeptide melittin makes up 40-60 percent of the dry weight of bee venom and causes the pain of bee stings. Apamin, which makes up 2-3 percent of bee venom dry weight, is a neurotoxin that inhibits Ca++ -activated K+ channels in the central nervous system. It is used in biomedical research to study how these channels work. In South Korea, manufacturers put bee venom extracts into skin care products, citing the benefits of traditional medicine. Consumers who use these products have inadvertently found an antifungal effect. Recently, Park et al. investigated the antifungal properties of bee venom. The experimenters prepared cultures of Trichophyton rubrum, the pathogen responsible for athlete’s foot and jock itch, on potato dextrose cornmeal agar plates. They exposed each culture to one of four different treatments: raw bee venom, a commercial bee-venom-based skincare product, apamin, or melittin. They let each T. rubrum culture grow for two weeks. Every two days, the experimenters calculated the growth rate of each T. rubrum culture. They found that melittin and apamin do not inhibit T. rubrumgrowth, but raw bee venom and the skincare product do inhibit growth. They conclude that bee venom does have antifungal potential, but neither melittin nor apamin can inhibit fungus alone. Bee venom will need more investigation before it can see clinical use. Park J, Kwon O, An HJ, Park KK. Antifungal Effects of Bee Venom Components on Trichophyton rubrum: A Novel Approach of Bee Venom Study for Possible Emerging Antifungal Agent. (2018). Annals of Dermatology 30:2. doi: 10.5021/ad.2018.30.2.202. Valproic acid is an anticonvulsant drug that was first synthesized in 1882 and thought to have no biological activity. In 1962, Pierre Eymard discovered its anticonvulsant properties by accident when he used it as a carrier for other anticonvulsant drugs in a trial on rats. Today, valproic acid is on the World Health Organization list of essential medicines and a common treatment for epilepsy. Valproic acid also has FDA approval for the treatment of bipolar disorder. Its mechanism of action is not fully understood. It may work by increasing levels of GABA in the brain or by inhibiting histone deacetylase and thereby altering brain gene expression. In 2018, Joshi et al. hypothesized that valproic acid and the mood stabilizer lithium alter the expression levels of synapsin, proteins expressed in neurons that regulate synapse function, including vesicle maintenance and neurotransmitter release. The researchers dosed rats with lithium, valproic acid, or saline twice daily for two weeks. RNA was then extracted from the brain tissue of the rats, and real-time PCR was used to measure the synapsin expression level. Rats dosed with lithium or valproic acid showed increases in synapsin expression across several brain tissues. Specifically, synapsin IIa increased by about 25% in the hippocampus and prefrontal cortex, and synapsin IIb increased by 25-50% in the hippocampus and striatum. Both lithium- and valproic-acid-dosed rats saw these increases. Valproic acid may work to treat epilepsy and bipolar disorder through the upregulation of synapsins. LKT Laboratories carries valproic acid as well as a number of anticonvulsant and antiepileptic molecules for research use. Joshi H, Sharma R, Prashar S, Ho J, Thomson S, Mishra R. Differential Expression of Synapsin I and II upon Treatment by Lithium and Valproic Acid in Various Brain Regions. International Journal of Neuropsychopharmacology (2018) 21(6): 616–622. Palbociclib is a chemotherapy drug used to treat advanced breast cancers. In a phase 3 clinical trial, a combination of palbociclib and fulvestrant more than doubled median progression-free survival time in women with ER+, HER- breast cancer compared to fulvestrant alone. Palbociclib received accelerated approval from the FDA in 2015 for ER+ breast cancers, and in 2017 was approved for the treatment of HER2- breast cancers. The cyclin-dependent kinases CDK4 and CDK6 cause cells to pass from the G1 phase to the S phase and divide. Palbociclib works by selectively inhibiting these kinases. Recently, Miettinen et al. argued that palbociclib’s remarkable effectiveness against breast cancer can not be explained by CDK4 and CDK6 inhibition alone. They used a method called cellular thermal shift assay to investigate other targets of palbociclib within the cell. This assay measures changes in the thermal stability of proteins in living cells, which can be used to determine which proteins are bound or modified by the drug of interest. Miettinen et al. found that palbociclib targets the proteasome in a breast cancer cell line. Palbociclib activates the proteasome by preventing the suppressor protein ECM29 from binding to it. The authors speculate that tightly regulated proteasome activity is required for cell division, so palbociclib’s activation of the proteasome could be another way that it treats breast cancer. Miettinen TP, Peltier J, Hartlova A, Gierlinski M, Jansen VM, Trost M, Bjorklund M. Thermal proteome profiling of breast cancer cells reveals proteasomal activation by CDK4/6 inhibitor palbociclib. (2018). doi: 10.15252/embj.201798359. SfN 2018 Apple Watch Winner! Dr. Kevin Jones from the Laboratory of Cellular and Molecular Neuropharmacology in the Department of Pharmacology at the University of Michigan Medical School is this year’s lucky winner. 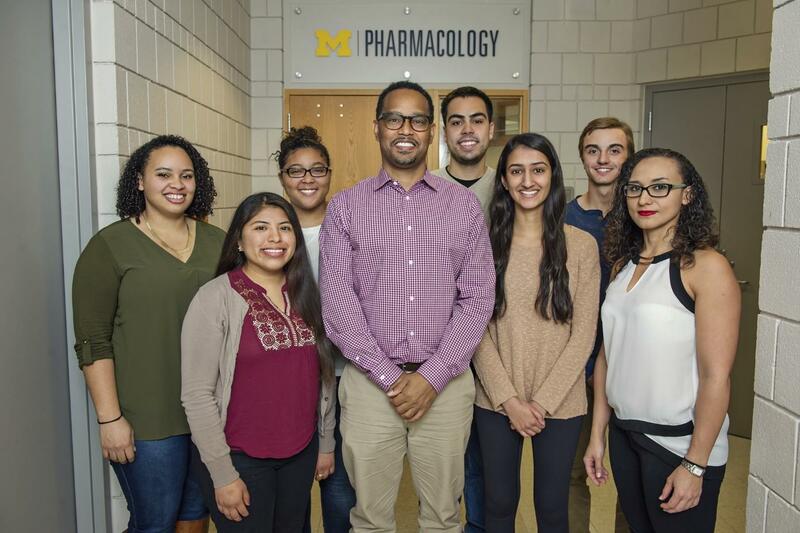 (From L): Nichelle Jackson, Mirella Hernandez, Taylor Craig, Dr. Kevin Jones, Jean-Carlos Rodriguez, Janvi Patel, Dillon McCallum, Dr. Heidi Matos. Not pictured: Dr. Monica Bame, Humza Shakut. The Effect of Microtubule Destabilizing Agents on Docetaxel-Resistant Breast Cancer Cells. Resistance to chemotherapeutics is a common adverse event in the treatment of breast cancer. The chemotherapeutic agent docetaxel is in common use as a chemotherapeutic, but resistance to treatment after long exposure is a common downfall of docetaxel. Overcoming resistance to well used chemotherapeutic agents would be a boon to the fight against cancer. A recent article found in PLoS ONE investigates the effect of treatment of docetaxel-resistant MCF-7 breast cancer cells with microtubule destabilizing agents, in the hope of overcoming taxane-resistance. The work reported that taxane-resistant MCF-7 cells were still resistant to treatment with vinca alkaloids, but colchicine binding site agents were more potent in the docetaxel-resistant MCF-7 cells than in wild-type MCF-7 cells. In addition to colchicine, other colchicine binding site agents also showed the same pattern against wild-type and docetaxel resistant MCF-7 cells. One such colchicine binding site agent exhibiting this property was 2-methoxyestradiol. However, the vinka alkaloids vinorelbine and vinblastine lost potency against the docetaxel-resistant MCF-7 cells. Both of these vinka alkaloids showed about a 3-6 times decrease in potency between wild-type and taxane-resistant cells. The overall potency is still sub-micromolar in the cytotoxicity assay. In all, colchicine binding site agents may be suitable for co-administration with docetaxel to overcome drug-resistance mechanisms. These microtubule interacting compounds are available from LKT Laboratories, Inc. for your research needs. Curcumin is the active ingredient found in turmeric, a common spice used all over the world. The beneficial effects of curcumin intake have been investigated extensively, but a new paper published in Proceedings from the National Academy of Sciences reports a new target for curcumin. Researchers report evidence of the protein kinase dual-specificity tyrosine regulated kinase 2 (DYRK2) as a receptor for curcumin. In vitro biochemical assays show that curcumin had an IC50 value of 5 nM against DYRK2. Additionally in an assay against 144 different protein kinases, curcumin is a selective ligand for DYRK2, with an IC50 10 fold greater than the next nearest kinase. The authors further confirm DYRK2 as the target of curcumin by overexpressing DYRK2 in HEK293T cells, and noting a decrease in phosphorylation of tyrosine 25 in the RPT3 subunit of the 26S proteasome, the major target of DYRK2. Additionally, the researchers publish a crystal structure of DYRK2 with curcumin bound in the active site, noting the important amino acid residues for binding. In cell-based experiments, curcumin shows anti-cancer capabilities. Curcumin shows anti-proliferative, anti-invasive and apoptotic tendencies in MDA-MB-231 triple negative breast cancer cells and HaCaT cells. The researchers also found a synergistic relationship between curcumin and carfilzomib, a proteasome inhibitor marketed for the treatment of triple negative breast cancer patients and multiple myeloma. Curcumin in conjunction with other proteasome inhibitors could make an interesting combination for the treatment of disease. LKT Laboratories, Inc. offers curcumin for research at two different specifications, to meet all your research needs. Banerjee S, Chenggong J, Mayefield JE, Goel A et al. “Ancient drug curcumin impedes 26S proteasome activity by direct inhibition of dual-specificity tyrosine-regulated kinase 2.” Proc. Nat. Acad. Sci. 2018, 115(32): 8155-8160. doi: 10.1073/pnas.1806797115. A recent study published in Frontiers in Neuroscience reports beneficial effects of the tobacco cembranoid, β-cembrenediol for Parkinson’s Diesease (PD). Researchers report encouraging results in both in vitro and in vivo 6-hydroxydopamine PD model, a model that mimics the long-term neurodegeneration found in PD-affected brain tissue. The researchers found that when co-administered with 6-hydroxydopamine, β-cembrenediol increased cell viability of neuro-2a cells to 80% of control levels, compared to only 55% viability in cells treated only with 6-hydroxydopamine. β-cembrenediol also returned phosphorylated Akt and HAX-1 protein to levels near untreated cells. It also decreased the amount of cleaved caspase-3 found in 6-hydroxydopamine treated cells. Additionally, the researchers performed two motor tests of rat models with 6-hydroxydopamine. Sprague-Dawley rats treated with 6-hydroxydopamine show limb asymmetry and motor dysfunction in a cylinder test and corner test experiment. The researcher found that when β-cembrenediol was co-administered with 6-hydroxydopamine, the rates returned to normal motor function after 4 weeks post- injection. Immunohistochemical staining of brain tissue from these rats also demonstrated a return to normal looking tissue compared to untreated animals. This study demonstrates the potential of tobacco cembranoids for the treatment of neurological disorders. Hu J, Ferchmin PA, Hemmerle AM et al. (2017) 4R-Cembranoid Improves Outcomes after 6-Hydroxydopamin Challenge in Both In Vitro and In vivo Models of Parkinson’s Diesease. Front. Neurosci. 11:272. doi: 10.3389/fnins.2017.00272. Rho-associated protein kinase (ROCK) belongs to the family of serine/threonine kinases. Research shows that ROCK signaling plays a role in several diseases, including diabetes, Parkinson’s, amyotrophic lateral sclerosis, pulmonary hypertension, and cancer. A new study published in January 2017 demonstrates that ROCK2 has a larger impact on the regulation of Ewing sarcoma (EWS) malignancy than ROCK1. In patient-derived cell lines, ROCK2 expression was higher in the metastasis derived cell line compared to the primary tumor derived cell line. Gaining a better understanding of ROCK inhibition may provide new insights on treatment of sarcomas1. Another study found that inhibition of the RhoA/ROCK pathway has a protective effect on glomerular inflammation found in diabetic nephropathy. Treatment with the inhibitor Y27632 decreased the release of adhesion molecules in rat glomerular endothelial cells incubated with advanced glycation end products. Blocking this pathway protects the kidneys and improves kidney function without causing inflammation2. LKT Labs offers several high purity ROCK inhibitors for research use. 2. Sci Rep. 2017 Jan 5;7:39727. doi: 10.1038/srep39727. Inhibition of the RhoA/ROCK pathway can benefit the kidneys in diabetics. A recent study at the Icahn School of Medicine contends HCN channels to have substantial potential as a target for major depressive disorder therapeutics. Several animal models of depression have been able to demonstrate that ionic mechanisms play a key role in neuronal homeostasis and dysregulation. Because HCN channels are confirmed to regulate neuronal excitability, they may also have a role in mediating depression-related excitability. The endocannabinoid system is a set of proteins and endogenous ligands that regulates a variety of biological processes. It consists of cannabinoid receptors 1 (CB1) and 2 (CB2), the natural ligands 2-arachidonyl glycerol (2-AG) and N-arachidonylethanolamide (AEA or Anandamide), as well as proteins responsible for the hydrolysis of these ligands, such as monoacyl glycerol lipase (MAGL), fatty acid amide hydrolase (FAAH) and alpha/beta hydrolase domain 6 (ABHD6). CB1 is located mainly in brain tissues, while CB2 is found in the periphery. Endocannabinoid modulation is a research topic in neuroscience, immunology, cancer and obesity research. Cannabinoid receptors 1 and 2 are G-protein coupled receptors (GPCRs). The results of activation/inhibition of CB1 and CB2 are still being explored. Besides endogenous ligands 2-AG and AEA, many synthetic endocannabinoids have been discovered. Mixed agonists (which interact with both CB1 and CB2) include WIN 55,212-2 and CP 55,940. Both of these agonist are able stimulate cannabinoid signaling, with no preference between the two receptors. Stimulation of CB1 and CB2 has been tied to analgesia, anti-diabetic, anti-obesity and anti-inflammation. Antagonism of the cannabinoid receptors is under study for decreasing CB signaling. CB antagonists have been used in neuroscience, cancer and immunology research. AM251, a selective CB1 inverse agonist demonstrated benefits in an anti-obesity system. AM630, a selective CB2 inverse agonist, activates TRPA1 in sensory neurons. CB2 selective agonists are ubiquitous throughout current academic literature. Synthetic CB2 agonists have been used to study the role of endocannabinoids in neurodegenerative disorders, diabetes, obesity and cancer. Agonists of the CB2 receptor have especially shown benefits as analgesic and anti-allodynic compounds. Fatty acid amide hydrolase (FAAH) is responsible for the hydrolysis of AEA to arachidonic acid. Inhibition of FAAH results in an increase in AEA, which can stimulate CB1 and CB2 and activate down stream signaling pathways. FAAH inhibition is under investigation for pain attenuation and the reduction of neuro-inflammation. FAAH inhibitor URB597 demonstrates analgesic effects in mice. Inhibitor PF-3845 also reduces pain in mice stimulated with LPS, and reduces inflammation in mice models for traumatic brain injury. Monoacylglycerol lipase (MAGL) is responsible for the hydrolysis of 2-AG to arachidonic acid. Increasing the amount of 2-AG stimulates cannabinoid signaling. Inhibition of MAGL increases 2-AG, showing the benefits of increased 2-AG. JZL 184, an inhibitor of MAGL decreases pain in multiple mouse models, showing anti-nociceptive and reducing pain-related to cancer drugs in mice. URB602, another inhibitor of MAGL, also demonstrates anti-nociceptive properties. Alpha/Beta hydrolase domain 6 (ABHD6) also hydrolyzes 2-AG to arachidonic acid. The ABHD inhibitor WWL70 reduces weight gain in diet-induced obese mice. It also has anti-inflammatory properties by reducing the amount of pro-inflammatory prostaglandin expression. Hamamoto DT, Giridharagopalan S, and Simone DA. Acute and chronic administration of the cannabinoid receptor agonist CP 55,940 attenuates tumor-evoked hyperalgesia. Eur J Pharamacol. 2007 Mar 8;558(1-3): 73-87. PMID: 17250825. Patil M, Patwardhan A, Salas MM, et al. Cannabinoid receptor antagonists AM251 and AM630 activate TRPA1 in sensory neurons. Neuropharmacology, 2011. Sep;61(4):778-88. PMID: 21645531. Jenkin KA, O’Keefe L, Simcocks AC, et al. Chronic administration of AM251 improves albuminuria and renal tubular structure in obese rats. J Endocrin. 2015 May;225(2)113-24. PMID: 25804605. Negrete R, Hervera A, Leazez S et al. The antinociceptive effects of JWH-015 in chronic inflammatory pain are produced by nitric oxide-cGMP-PKG-KATP pathway activation mediated by opioids. PLoS One. 2011;6(10):e26688. PMID: 22031841. Ibrahim MM, Deng H, Zvonok A et al. Activation of CB2 cannabinoid receptors by AM1241 inhibits experimental neuropathic pain: pain inhibition by receptors not present in the CNS. Proc Natl Acad Sci USA. 2003 Sep 2;100(18):10529-33. PMID: 12917492. Booker L, Kinsey SG, Abdullah RA et al. The fatty acid hydrolase (FAAH) inhibitor PF-3845 acts in the nervous system to reverse LPS-induced tactile allodynia in mice. Br J Pharmacol. 2012 Apr;165(8):2485-96. PMID: 21506952. Comelli F, Giagnoni G, Bettoni I et al. The inhibition of monoacylglycerol lipase by URB602 showed an anti-inflammatory and anti-nociceptive effect in a murine model of acute inflammation. Br J Pharmacol. 2007 Nov;152(5):787-94. PMID:17700715. Woodhams SG, Wong A, Barrett DA et al. Spinal administration of the monoacylglycerol lipase inhibitor JZL 184 produces robust inhibitory effects on nociceptive processing and the development of central sensitization in the rat. Br J Pharmacol. 2012 Dec;167(8):1609-19. PMID: 22924700. Tanaka M, Moran S, Wen J et al. WWL70 attenuates PGE2 production derived from 2-arachidonoylglycerol in microglia by ABHD6-independent mechanism. J Neuroinflammation. 2017 Jan 10;14(1):7. PMID: 28086912. Cyclin-dependent kinases (CDKs) are an enzyme family that control cellular proliferation and growth. The interaction of CDKs with D-type cyclins results in the inactivation of retinoblastoma (Rb) tumor suppressor protein. Inhibiting the CDKs therefore allows the tumor suppressor to remain active. Abemaciclib has previously demonstrated antitumor activity in HR+/HER2 metastatic breast cancer, renal cell carcinoma and several other solid tumor types. It’s been found to selectively inhibit CDK4 and CDK6. A recent study by Kosovec et al, further tests the potential of abemaciclib, this time for the treatment of esophageal adenocarcinoma (EAC). The study evaluated several cell lines, monitoring apoptosis, proliferation, and pathway regulation during treatment with abemaciclib. Additionally, animals were induced to develop EAC and then treated with abemaciclib by intraperitoneal injection. The study was quite successful, the treated animals showed decreased tumor volumes and decreased prevalence of the disease altogether, while the treated cell lines showed increased apoptosis and decreased proliferation. Overactive CDKs or inactive Rb protein are a common thread among several different cancer types, which makes CDK an interesting target of investigation for cancer treatments. Kosovec JE, Zaidi AH, Omstead NA, et al. CDK4/6 dual inhibitor abemaciclib demonstrates compelling preclinical activity against esophageal adenocarcinoma: a novel therapeutic option for a deadly disease. Oncotarget. 2017 Nov 1;8(59):100421-100432. doi: 10.18632/oncotarget.22244. The Karyopherin superfamily consists of seven known proteins that mediate the majority of transport of molecules through the nuclear pores in a cell nucleus. One of these proteins: chromosome region maintenance1 (CRM1, aka XPO1 or exportin1) is a key transporter protein that exports cargo from within the cell nucleus out to the cytoplasm. The role of CRM1 is to export tumor suppressor proteins and growth regulatory proteins. Over-expression of CRM1 has been found in various malignancies and leads to mislocalization of several growth and survival factors. Inhibiting CRM1 leads to an accumulation of tumor suppressor proteins, which eventually triggers apoptosis, killing off the problem causing cell. CRM1 also plays an important role in viral replication. Preventing this protein, which the virus is dependent on for survival, to function should then prevent the virus from replicating, effectively shutting it down. Lab studies have found that the CRM1 inhibitor KPT-276 shows activity against several types of cancer, including glioblastoma, lung cancer, and breast cancer, among others. Studies on the CRM1 inhibitor verdinexor have shown that these inhibitors also act as antiviral agents. Both in vitro and in vivo studies have demonstrated the antiviral benefit of a treatment based on CRM1 inhibition, particularly in the face of the drug resistance that has developed against common antiviral drugs. The CRM1 inhibitors KPT-276 and Verdinexor are now available from LKT Laboratories for further research use. Mathew C, Ghildyal R. CRM1 inhibitors for antiviral therapy. Front Microbiol. 2017;8:1171. doi: 10.3389/fmicb.2017.01171. Cheng Y, Holloway MP, Nguyen K, et al. XPO1 (CRM1) inhibition represses STAT3 activation to drive a survivin-dependent oncogenic switch in triple-negative breast cancer. Mol Cancer Ther. 2014 Mar; 13(3):675-686. doi: 10.1158/1535-7163.MCT-13-0416. Green Al, Ramkissoon SH, McCauley D, et al. Preclinical antitumor efficacy of selective exportin 1 inhibitors in glioblastoma. Neuro Oncol. 2015 May;17(5):697-707. doi: 10.1093/neuonc/nou303. Lundberg L, Pinkham C, de la Fuente C, et al. Selective inhibitor of nuclear export (SINE) compounds alter new world alphavirus capsid localization and reduce viral replication in mammalian cells. PLoS Negl Trop Dis. 2016 Nov 30;10(11):e0005122. doi: 10.1371/journal.pntd.0005122. Perwitasari O, Johnson S, Yan X, et al. Antiviral efficacy of verdinexor in vivo in two animal models of influenza A virus infection. PLoS One. 2016 Nov 28;11(11):e0167221. doi: 10.1371/journal.pone.0167221. Incidence of diabetes has been growing worldwide over the last 20 years. Due to its impact on health worldwide, a search for novel treatment options for diabetes has been undertaken. Two promising compounds for the treatment of type 2 diabetes mellitus are linagliptin and empagliflozin. Linagliptin is an inhibitor of dipeptidyl peptidase-4 (DPP-4). DPP-4 is expressed in a wide variety of cells, and performs various functions in these cells. In diabetes, inhibition of DPP-4 leads to an increase of insulin and lowering of blood glucose. Linagliptin is efficacious in rodent models mimicking type 1 diabetes. Linagliptin reduces oxidative stress to levels of normal rats, lessens incidence of cardiac injury. Additionally, linagliptin reduces renal injury and ameliorates kidney fibrosis in the same streptozotocin-induced type 1 diabetes rodent model. Empagliflozin is an inhibitor of sodium glucose cotransporter type 2 (SGLT-2). Empagliflozin lowers the amount of blood glucose and increases the amount of insulin found in Zucker diabetic fatty rats. It also reduces cardiovascular stress in type 2 diabetes mice models with prolonged treatment. Combined treatment with lingaliptin/empagliflozin in human subjects showed modest weight loss, and no incidents of hypoglycemia. Linagliptin and Empagliflozin are now available from LKT Laboratories, Inc. for your research needs. Hansen HH, Jelsing J, Hansen CF et al. The Sodium Glucose Cotransporter Type 2 Inhibitor Empagliflozin Preserves Beta-Cell Mass and Restores Glucose Homeostasis in the Male Zucker Diabetic Fatty Rat. J Pharmacol Exp Ther. September 2014. 350:657-664. doi: 10.1124/jpet/114/213454. Kanasaki K, Shi S, Kanasaki M et al. Lingaliptin-Mediated DPP-4 Inhibitions Ameliorates Kidney Fibrosis in Streptozotocin-Induced Diabetic Mice by Inhibiting Endothelial-to-Mesenchymal Transition in a Therapeutic Regimen. Diabetes. June 2014. 63:2120-2131. doi: 10.2337/db13-1029. Lin B, Koibuchi, N, Hasegawa, Y et al. Glycemic control with empagliflozin, a novel selective SGLT2 inhibitor, ameliorates cardiovascular injursy and cognitive dysfunction in obese and type 2 diabetic mice. Cardiovascular Diabetology, 2014, 13:148. doi: 10.1186/s12933-014-0148-1. Salheen SM, Panchapakesan U, Pollock CA and Woodman OL. The Dipeptidyl Peptidase-4 Inhibitor Linagliptin Preserves Endothelial Function in Mesenteric Arteries from Type 1 Diabetic Rats withouth Decreasing Plasma Glucose. PLoS ONE 10(11): e0143941. doi: 10.10371/journal.pone/0143941. Woo, V. Empagliflozin/linagliptin single-tablet combination: first-in-class treatment option. Int J Clin Pract, Dec 2015, 69, 12, 1427-1437. doi: 10.1111/ijcp.12720. LKT Labs continues to expand its catalog with six new compounds for the new year… the first of many additions in store for 2018! P327211 Pifithrin-α Hydrobromide: Inhibitor of p53 that may also inhibit other signaling pathways including heat shock and glucocorticoid. P327212 Pifithrin-α-cyclic Hydrobromide: A more stable and less cytotoxic analog of pifithrin-alpha. B030966 BAY 11-7082: Potential inhibitor of NF-kB, and many components of inflammatory signaling pathways including PI3K/Akt/IKK/NFkB, ERK/JNK/AP-1, TBK1/IRF-3, and Jak-2/STAT-1. R183731 Resiquimod: An imidazoquinoline compound that is a TLR7/8 agonist. L337521 Linagliptin: A dipeptidyl peptidase 4 inhibitor glucose-lowering compound with low risk of inducing hypoglycaemia. E499601 Empagliflozin: A sodium glucose cotransporter 2 inhibitor found to ameliorate glucose intolerance and insulin resistance. Nemorosone is a polycyclic polyprenylated acylphloroglucinol derived from beeswax and bee saliva. Closely related to hyperforin, nemorosone shows activity as an anti-cancer and anti-inflammatory compound. Nemorosone inhibited growth of xenografts of MIA-PaCA-2 pancreatic cancer cells in mice over a 28-day trial period. Nemorosone showed better activity than standard treatment with gemcitabine in the same model. Additionally, nemorosone does not activate CYP3A4, unlike structurally related molecule hyperforin. Nemorosone, therefore, has a longer half-life and better absorption in biological systems. Nemorosone is available exclusively from LKT Laboratories, Inc. Right now there are millions of people worldwide who are suffering from Alzheimer’s disease. Alzheimer’s is the most common form of dementia, but it is actually not a normal part of aging. The underlying cause is not yet understood and there is no cure, although there are medications that may help to improve some of the symptoms of the disease. There are currently several medications to enhance cognition available for people suffering from Alzheimer’s disease. Comparison of the safety and effectiveness of the four FDA-approved drugs: donepezil, rivastigmine, galantamine, and memantine, ranked donepezil as most effective. Donepezil has proven to be effective in moderate to severe Alzheimer’s, however, in mild cases it did not improve cognition but rather produced several adverse side effects. A new study with grey mouse lemurs shows that sleep-induced memory impairment was reversed by acute administration of donepezel and memantine in both young and aged animals. This study gave similar results as observed with monkeys and with humans, but contrasted with the observations from studies that had used rodents. Mouse lemur is one of the smallest primates in the world. Because the lemur is a primate, it has a closer phylogenetic proximity to humans, and may therefore be a better model for drug development, and particularly for research on aging. Perhaps research using lemurs or other primates rather than rodents may prove to be a more powerful comparison tool and help to get to the bottom of this disease. Nauert, Rick. Study finds donepezil best Alzheimer’s drug for improving cognition. Psych Central. 2 Oct. 2017. Accessed 19 Oct 2017.